Defining the exact meaning of a commonly-used term is not easy and is subject to interpretation. ADVENTITIOUS BUD A bud that occurs in an unusual place on a tree. APEX The highest point of the tree, this can be a single branch or can consist of a series of small branches. APICAL Growth produced by a plant which is most vigorous, in the majority of species this at the furthest points of the plant from the rootsystem (upper and outermost branches)..
BACKBUDDING Process by which apical growth is pruned to induce growth further back along the branch or trunk. BUDBREAK The point at which a bud has opened enough to show a green tip. BUDBURST The point at which a buds contents unfurl (the new leaves appear). BUD EXTENSION The point before Budbreak where the tiny buds that have been on the branch since the previous year begin to swell and extend. BRANCHES The Primary branches are those that grow directly from the trunk; the Secondary branches are those that grow directly from the primary branches, the Tertiary branches grow from the secondary branches. BROAD-LEAVED/CONIFEROUS Conifers belong to the group of naked-seeded plants known as gymnosperms, their seeds are not enclosed in an ovary. Conifers have leaves which are needle-shaped or scale-like. With a few notable exceptions they are evergreen. Broad-leaved trees are a much larger group belonging to the angiosperms or flowering plants which have seeds enclosed in an ovary. The majority are deciduous and go dormant in Autumn through to Spring. BUD Organ or shoot that contains an embryonic branch, leaf or flower. BUTTRESSING This is also known as root-flare, where the base of the tree flares outwards giving the feeling of great age and solidity. CAMBIUM Green growth tissue directly below the bark, its increase adds to the girth of roots and stems. CALLUS Tissue that forms over a wound on a branch or trunk as part of the healing process. CANDLE Name given to the extending bud of a Pine before the new needles open. CHLOROSIS Loss of chlorophyll and leaf colour as a result of mineral deficiency. CHOP Commonly used word that describes the heavy pruning and reduction in height of the trunk of a tree. COMMON NAME Simply the name a plant is commonly known by, however, common names can be very non-specific ('Maple' could refer to any one of hundreds of trees) and can vary from region to region. It is always better to try to remember a trees' specific Latin name as this nomenclature is specific to each and every plant, the world over. CULTIVAR A cultivated variety of a species i.e. Acer palmatum 'Bloodgood' or Acer palmatum 'Deshojo' are both Acer palmatum cultivars or varieties. DESSICATION Lack of water; desiccated leaves usually occur when the roots are unable to supply water to them. DECIDUOUS A plant that sheds its leaves each year in Autumn- this can be a broad-leaved or a coniferous tree. DEFOLIATION The process of partly or completely removing the leaves of a tree during its summer dormant period to induce a crop of finer, smaller leaves which can greatly increase ramification. DIEBACK Death of growth beginning at tip from disease or injury. DISSECTED Deeply cut into segments or lobes. ERICACEOUS A term referring to acid loving, lime-hating plants. EVERGREEN A plant that remains in leaf all year. It should be noted that evergreen trees slowly shed their oldest leaves at certain times of the year (depending on species) as they are replaced by new growth. GENUS The name given to a group of plants that have a common feature- the first part of a plants Latin name i.e. ACER palmatum. INCH Imperial Measurement replaced by metric nearly 40 years ago but still in use today in some countries. One inch (1") equals approximately 2.5cm, or, just under a typical man's thumb width. INDOOR BONSAI More difficult to maintain than outdoor bonsai, indoor bonsai are normally tropical or subtropical species that need to be kept inside for part of the year, usually during periods of cold temperatures outside. INTERNODE Section of growth between two nodes (leaves or leaf-joints). JIN A deadwood effect on a bonsai- can be either an old branch or a protruding part of the trunk. Jins can be found naturally occurring on old collected trees though are more often than not, artificially created from unwanted branches. LAYERING Ground and airlayering are methods of producing new roots from the trunk or branches of a tree; often used as a propagation method but also useful for correcting poor surface rots (nebari). LITERATI A bonsai form where the tree has a tall, slender trunk with no lower branches and only sparse foliage confined to the upper reaches of the tree. MAME Name given to bonsai less than 15cm/6 inches in height. NEBARI Commonly-used Japanese term to describe the surface roots of a bonsai (those that can been seen on or above the surface of the soil). NODE Growth point on a branch or trunk from which leaves, leaf buds and shoots can arise. OVERWATERING Where a tree growing in poor-draining soil is given water too frequently (the soil does not begin to dry out before more water is applied). This decreases even further the amount of air available to the roots caused by the poorly drained soil. Eventually leads to dead roots and root rot. PEAT Organic bonsai soil component that has rightly fallen from favour amongst bonsai enthusiasts. RAMIFICATION The repeated division of branches into secondary branches. SEASONAL BONSAI Species that only look their best for a short period of the year, for instance trees grown for their flowers or fruit. SHARI Deadwood on the trunk of a bonsai (as opposed to Jin which is a deadwood branch or protrusion). SOIL In the context of bonsai, soil does not refer to the soil found in the ground but specialist bonsai soils used for growing bonsai. Organic soils are those that contain ingredients derived from plants; peat, bark or leaf litter. Inorganic soils contain inert materials, mineral, stone or hardened/fired clays such as grit, sand, akadama or turface. SUIBAN A shallow tray with no drainage holes that is commonly filled with either gravel or water and can house rock plantings. SPECIES The subdivision of Genus; the second name in Latin nomenclature i.e. Acer PALMATUM. SPHAGNUM MOSS Generic/general name given to long-fibred moss, used as a soil component for bonsai and layering. Sphagnum Moss Peat is rotted and broken down Sphagnum Moss and does not have the same positive properties for bonsai or layering. STYLE The style of a tree has previously been used to describe the main direction the trunk of a tree takes, this should be correctly referred to as the FORM. 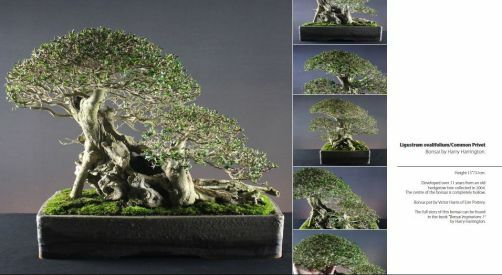 The style of the tree describes the way a bonsai has been shaped to create an image of its fully grown counterpart; this can be in a contemporary or a classical style, an impressionistic or an expressionistic style. SYNONYM An alternative Latin name for a plant, usually an old or invalid classification. TOKONOMA Traditional display area in a Japanese house where bonsai are brought inside for a short period and displayed with accent plantings and calligraphy. TREE Commonly bonsai growers will refer to their bonsai as trees rather than as bonsai. URO A carved (or natural) deadwood hollow, often seen on (but not limited to) deciduous trees. UNDERWATERING Where a tree is allowed to dry out or is not watered thoroughly when required. VARIETY The sub-division of Species ; the third name in Latin nomenclature i.e. Acer palmatum 'DESHOJO'. XYLEM Area below cambium in the trunk. YAMADORI Trees collected from the wild for the use as bonsai. Originally used to describe wild trees collected from mountainous regions.